East Fremantle wedding venues are emulating the Fremantle Wedding Walk with the Bridal Trail tomorrow, Sunday March 31, so go and check out some of the venues, have a meal or a drink and support the local businesses. I have never been married, probably due to me waiting for my beautiful lovers to propose to me because of my deep inherent shyness, but for those who went down on their knee and asked will you marry me, this weekend in Fremantle is a special one to help you plan your big day. THE FREMANTLE WEDDING WALK is on this Sunday! Register your attendance via Eventbrite for a glass of sparkling on arrival AND a chance to win a night at the newly refurbished National Hotel with a $50 voucher for Moore and Moore Cafe! What a great job the stonemasons have been doing on the Fremantle ‘Wedding Wall’ in Cliff Street! Notre Dame University decided to give the old heritage wall some tender loving care and re-open all the arches in the wall. I believe it looks fantastic already, but there is still some detailing to be done and a new coat of paint. The ‘Wedding Wall’ got its name because it is one of the favourite backdrops in Freo for wedding parties. The open arches create new opportunities for wedding photographers. The Moore&Moore cafe in Fremantle’s Henry Street is organising a WEDDING EXPO this Friday April 7 from 5.30 to 8.30. Entry is free. Anyway all you young and old lovers who want more than love as a commitment, head out to the Freo West End on Friday and get some valuable information for the most special day of your life. 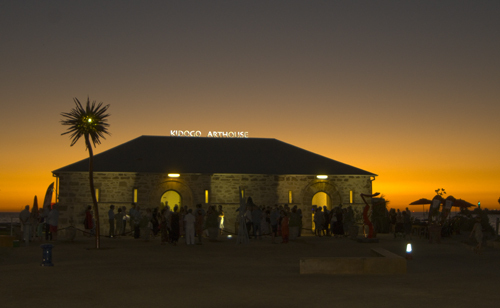 Kidogo Arthouse at Fremantle’s Bathers Beach must have set the record for most weddings in a day yesterday when 24 couples enjoyed doing the vows in a pop-up wedding. Marriage celebrant Joshua Withers conducted the ceremony while Poppy Willow of Bloom Stylist made sure the gallery looked the part. Photographer Anthea Auld recorded it all for prosperity. If you feel that expensive weddings are over rated or can’t afford a big one, why not check out this option. It is only $ 1,860 the website claims.